Articles / Suggested Content will not be seen if you use Home Page option – only when you turn it off! 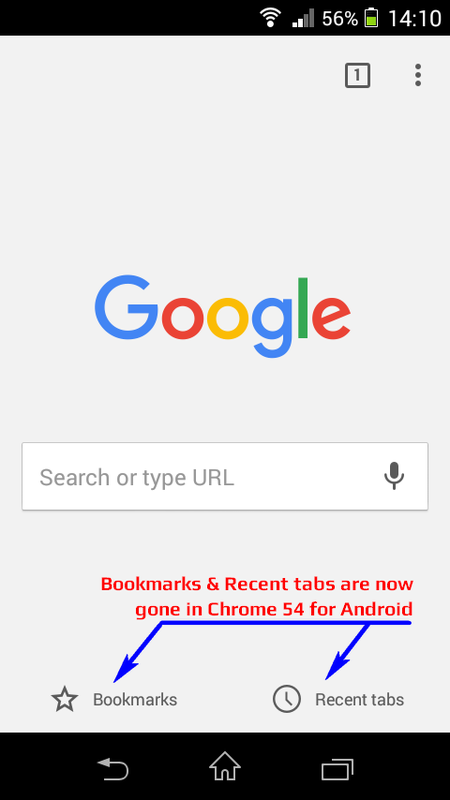 Since Chrome Mobile version 58 (and above), you can no longer use this method to restore Bookmarks and Recent Tabs shortcuts on the main startup screen, because they are now completely removed from the app itself and no longer supported. However, you can still use this method to remove advertisements / suggested content! 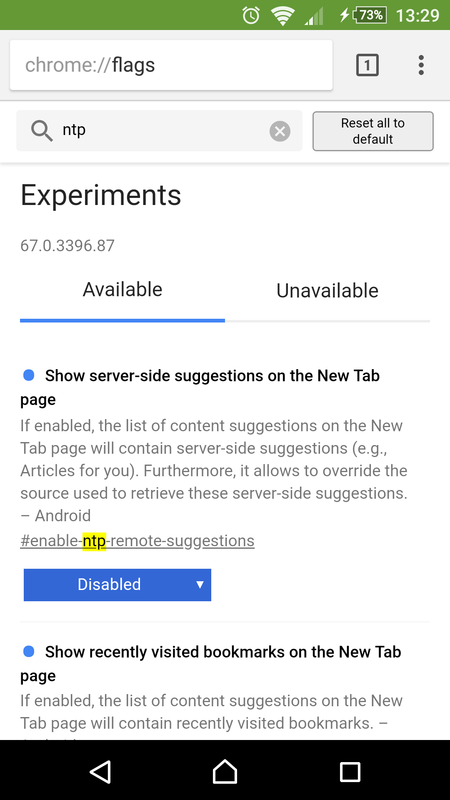 Google introduced a new update for Chrome App for Android few days ago (version 54.0) which brought yet another BIG CHANGE in the user interface. Chrome developers have removed Bookmarks and Recent Tabs from the bottom of the page on blank (new) tabs, and implemented a suggested content widget instead. As you can see on the screenshots, the “recommended articles for you” has nothing that I am personally interested in (yikes! ), but even if I did, it was a bad idea to hijack my most frequently used shortucts! However, the main problem here is the fact that there is NO option in the Settings page to turn it off. Take another look. Again. Nope. Nothing. You aren’t blind. It isn’t there! Thanks to Matt, our savior from mighty G, he revealed that options are indeed available * for now * but they are actually hidden in the flags page (read our article about Chrome hidden settings and other options here). * Chrome security will not allow you to directly click on the internal hidden system links from within a web page like this (the one you are reading). You need to manually type or copy/paste link text into the address bar. 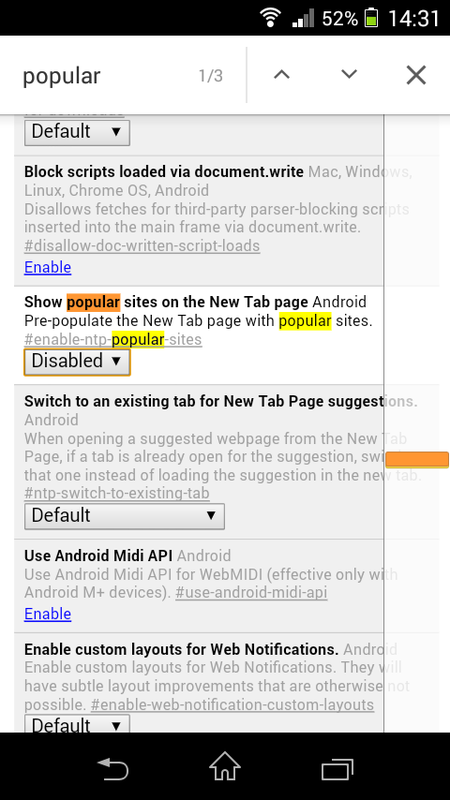 Then use Find in page to search for keywords snippets and popular and disable them all. Set all above NTP options (“flags”) to Disabled and hit RELAUNCH NOW to restart Chrome. Your regular blank start-up page with lonely search input box should be restored to it’s rightful throne. Believe it or not, we think that this change was inspired by Microsoft Edge browser. When you run Edge for the first time (on Windows 10), it will show you latest news and content that might interest you. However, you can easily turn-it off in the options, simply by choosing a new blank tab page on startup. As many times before, Google wants to mediate your content as much as possible. Inbox (for emails), now Chrome (for internet browsing), Android OS (for mobile devices); essentially, everything. This is another small step in a series to get users bind to the specific web services, and some of us may really like it, others well… not. 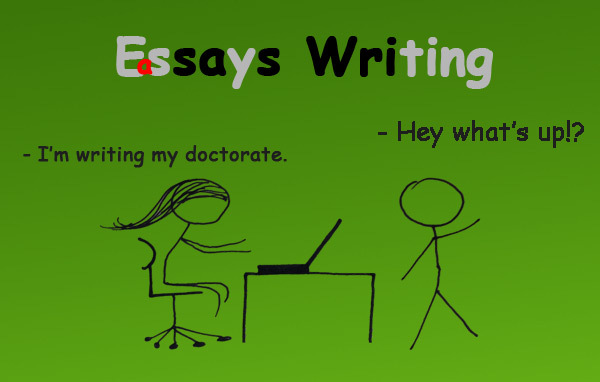 At least, not right away from the start, but later after some adaptation/acceptance period. But, it is always important to leave users an OPTION to disengage. Unfortunately, this time that option was left out either because of a simple developer omission or some other reason. For example, a more user-friendly / user-oriented solution for the recommended content could be to show it below the page fold and leave classic Bookmarks and Recent tabs shortcuts when users decide to scroll below them, automatically generating new content on page. Well, yeah, there’s always that. However, if you really want the same (or as close as possible) look & feel of Chrome browser, you can switch to Iron Browser, which is still at version 53.x (same as previous Chrome App version). Iron Browser, like many other open source versions, is also based on Chromium core — the very same open-source browser Google Chrome is, but with added “Google spices” on top. The only problem are bookmarks — you will have to (re)build all your Bookmarks manually, as they aren’t shared between browsers, unless you are clever enough to at least make a backup / export them to a cloud sync service. As we have already explained in our earlier article, anything contained in Chrome FLAGS page may be removed at any given point in time in the future versions! This means that Google might simply remove above overrides and leave you with NO CHOICE to turn it off. Enjoy it while it lasts. Always first create a phone backup (or targeted App backup) BEFORE upgrade, so you can always return to the older version later. (and optionally from your device only) filters to see current user feedback, before making own decision to upgrade. Thanks for report, haven’t checked yet myself. If true, well, it was good while it lasted, it’s about time to consider proposed alternatives in the article. 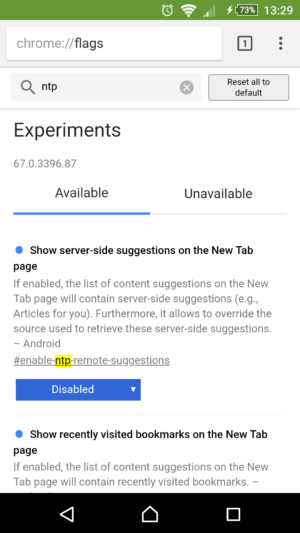 UPDATE: It is true that bottom Bookmarks and Recent Tabs shortcuts are permanently removed from Chrome 58/59 and above, but you can still disable suggested articles content using above method. Thank you for the info. You guys rule! 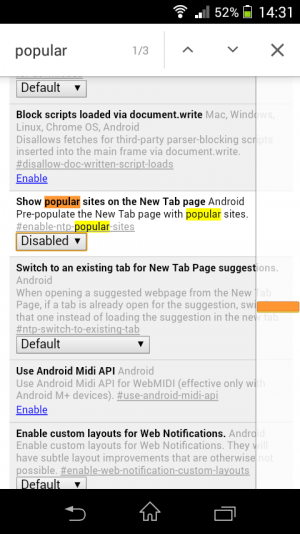 Chrome for android is increasingly becoming cripple-ware. Trying to fix anything is near impossible, the app has become a shell, requiring other apps to give it any functionality. For instance, unlike Windows Chrome, it is incapable of spell checking. Why? It seems like that is now something the keyboard is supposed to do. What if I want a non-Google keyboard since Google says on me more than enough already. For instance today, the first “suggestion” has a picture of Michelle Obama! Trust me I’ve seen enough of her to last a lifetime. Now, you folks with FIOS probably don’t realize this, but some rural Americans have satellite internet with BANDWIDTH caps. I don’t need to see suggestions nor all those d*mn auto play videos. If I wanted braindead, I would have an iPad. You can turn-off articles suggestions and ads on front start page pretty much by following this tutorial. It still works! You can get a good old plain start page, showing you only Google logo and input search box. About spell checking feature, you can send a message to app developers on Play Store and maybe they will consider it if many asks for it, but that is unlikely to happen. One of the reasons it is omitted is probably technical (app size, performance issues, complexity to implement that feature, other issues which are more urgent etc.). Another one is because Android OS auto-complete and spell checking feature built-in inside languages and keyboards (see Settings in Android) eliminates most of the typos, but not all. Also, that avoids duplicating code, features and maintenance. Also, spell checker in Desktop Chrome is not without flaws, either. It underlines some words which are not wrong, but simply not in the dictionary, or just do not comply with the dictionary version (e.g. capital first letter difference etc. ).